After a week writing about obscurities, reviewing Buster Keaton feels like a day off. Keaton’s films are, of course, well-known to most readers of this blog, and for those just discovering silent film, there is no body of work better suited to introduce it. Keaton’s comedy is today’s comedy. Its human relationships are awkward, poorly defined and unsentimental; simple misunderstandings carry the seeds of spectacular disaster, often triggered by the star’s efforts to do right; and most notably, his films give the impression of a man lost in a gigantic, impassive, amoral machine, in which his best efforts do not move him forward so much as keep him alive—jumping, ducking and otherwise dodging threats of destruction. Buster Keaton, bland but earnest, was not so different from a player-character in any mid-1980s action video game. While the character itself might be a cipher, an everyman, he was also ‘you’; and because your goal was to navigate a world that might very well be scrolling right to left whether you moved with it or not, you paid as much attention to the details of that world as you did to yourself. 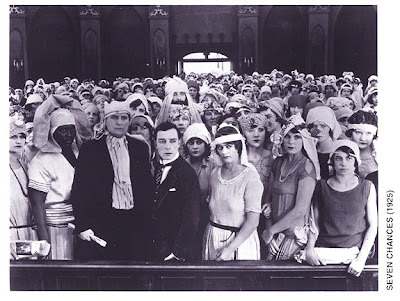 I had games on the brain watching Seven Chances, a finely executed feature from Keaton’s high period in the mid-1920s. When Seven Chances relies on pathos and subtlety for laughs, it is slick and unremarkable. But, when it focuses on the bigness of Keaton’s quest, in which he’s challenged to meet goals and avoid obstacles (some of them enormous and deadly), all while a clock counts down the minutes to his defeat, Seven Chances is one of the Keaton’s best films. The comic plays Jimmie Shannon, one half of the brokerage firm of Meekin & Shannon. Jimmie and his partner, Billy (T. Roy Barnes) are decent guys, but either incompetent or mildly crooked, since they’re facing insolvency (at best) in the first act. Enter the lawyer (Snitz Edwards), who informs the pair that Jimmie’s grandfather has died, and bequeathed him a fortune so large that it will solve all their woes—so long as Jimmie weds before 7 p.m. on the day of his twenty-seventh birthday. That day is today. This is all that Seven Chances, wonderfully, boils down to. Keaton, more than any silent comic, including Chaplin, excelled at minimalist plots like these—taking the simplest concept and exploding it into as many gags as he could. Nothing occurs in Seven Chances that does not evolve logically from Jimmie’s sudden problem, and the attempts made by him, his partner, and his lawyer, to solve it. These three stooges are in trouble, too, because Jimmie is single. In fact, he would like to be married, to a sweetie named Mary (Ruth Dwyer), but he cannot confess his feelings to her because he’s a loser. With time so short, he screws his courage and proposes anyway, but when she finds out his motivation, she’s turns him down. Now Billy, practical and desperate, takes over. With actuarial efficiency, he produces a list of seven women—all of whom can be found at the local country club—and tells Jimmie to propose to each. With each bomb, Billy strikes a line through a name. Jimmie, half in a daze, becomes so robotic that he follows one woman up a flight of stairs and, when rejected at the top, follows another down the stairs and is rejected again at the foot. This sense of ‘mechanism’ is stronger in Seven Chances than in any of Keaton’s other films, even machine-centred ones like The Navigator (1924) and The General (1926). Jimmie and Billy often move in unison, and several of Jimmie’s interactions with women, particularly the club’s hat-check girl, are so tightly paced that they make both parties seem like automatons in the same display. Notice also that the Billy, Jimmie and the lawyer are usually filmed standing in a row, from tallest to shortest, forming a straight line sloping downward (more on that later). Seven Chances emphasizes the inorganic, and even its best developed characters act like machines much of the time. Having failed with all seven of his chances, Jimmie wanders into town, hoping for a happy accident with some young lady but without any strategy in mind. Billy, meanwhile, has a brainstorm and decides to publish Jimmie’s plight in the afternoon edition of the local paper. Be at the church before 7 p.m. tonight, the headline tells everyone, and you could be a very rich wife. So begins Seven Chances’ third act, in which (at least) 500 veil-clad spinsters descend on the little church in search of one man. Jimmie is surrounded, and before he can even choose between his poor prospects, an addled minister informs them that they’ve been hoaxed. The crowd of ladies is then enraged, and Jimmie can only run for his life. 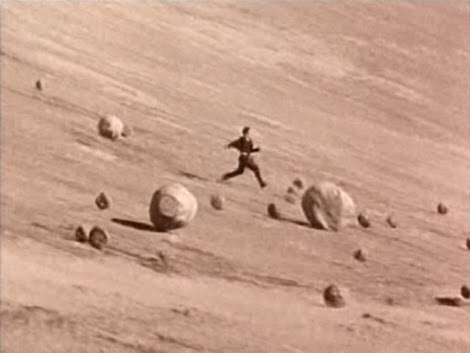 Watching this sequence again, I was reminded of Keaton’ 1922 short film, Cops, which used the same idea of one man pursued by hundreds of nearly identical people. Then I thought of George Romero, whose zombie movies aren’t so different, but for being filmed at a slower pace—after all, the zombies too are mindless, relentless, dogged, and numerous, overturning or smashing through every symbol of polite society in their way, just as the brides-to-be swarm and crush a streetcar, a football game, hunting grounds and a construction site. Finally, I thought of Pac Man. Like Jimmie Shannon, Pac Man’s quest is a simple one: eat all the dots. Like Jimmie, Pac Man shifts between predator and prey, either pursuing the ghosts or being pursued by them. This is also the basic structure of The General, which is half about Keaton giving chase, and half about Keaton getting away. Seven Chances’ last big gag is the most game-like of all. Still with the matrimonial mob on his heels, Jimmie comes to the top of an enormous hill, strewn with boulders. As he half-leaps, half-falls down the hill, the boulders begin to dislodge, rolling toward him faster than he can run. Keaton sidesteps, jumps and dives out of their way like Super Mario, unable to get further ahead because he’s too busy with the momentary challenges of this, his giant, inclined gameboard. 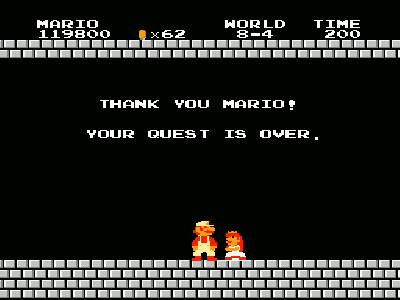 Would it surprise you to learn that Jimmie wins his princess in the end? In some ways, Seven Chances is Keaton’s least cynical feature, but that’s OK—having completed such a strenuous quest, you’d hardly want him cheated once it’s done. As for me, I have no complaints about Seven Chances, which is not Keaton’s greatest film, but definitely one of his purely funniest. Kino International’s The Art of Buster Keaton box set (also available as individual discs) packages Seven Chances with two of Keaton’s short films: Neighbours (1920) and The Balloonatic (1923). However, I had the pleasure of seeing this film live, as part of the Toronto Silent Film Festival. Many thanks to Shirley Hughes and her colleagues for organizing this event, and to the Toronto Film Society and the Toronto Theatre Organ Society, for their support. Seven Chances was accompanied by Wurlitzer organist Clark Wilson, who preceded his performance with some fascinating remarks on the history of silent film music—a unique artform that’s experiencing something of a revival today. Play on, I say. I'm sorry, I posted a comment for this entry in the wrong area. In going to post this it redirected me, for some odd reason, to your latest post.